SOLD FIRST WEEK - OVER ASKING! Tucked into the hills overlooking Beachwood Canyon, this sharp 1960s post and beam has been recently renovated and is on the market for the first time ever. Along with such quintessential midcentury modern traits as beamed ceilings, an open floorplan, and walls of glass, it features a bonus office that can be used as a bedroom, a modernized kitchen with Bosch appliances, wood floors, central ac/heat, a wood burning fireplace, skylights, and a balcony deck offering sweeping views all the way across the canyon from the Hollywood sign to the Griffith Observatory. 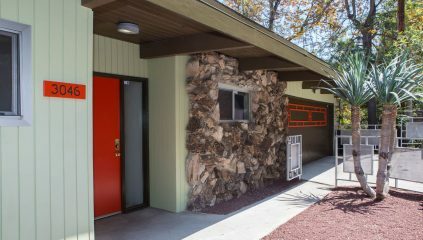 The garage has been converted to a soundproof recording studio, making this a dream home for musicians or voice-over artists. Located on a lush, tree-covered lot just a few short minutes from Lake Hollywood, Griffith Park, Franklin Village, and numerous TV & movie studios, it's also an ideal spot for those with country inclinations but city obligations.